Linda Allen is an Olympic course designer and an internationally recognized clinician on riding, show jumping, and course design. 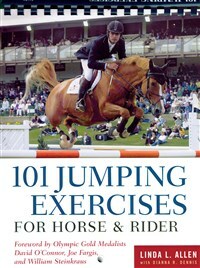 She is a former rider for the United States in international jumping competitions, and she designed the show-jumping courses for the 1996 Olympic Games in Atlanta, Georgia, as well as for other major international competitions. She is a licensed judge and a columnist for The Chronicle of the Horse. She lives in Salinas, California. Dianna Robin Dennis is a full-time equestrian writer and lifelong rider. She has written for many equestrian magazines in the United States and abroad, including The Chronicle of the Horse and Equestrian (Horse Show) magazine.